The Fair Labor Standards Act (FLSA) does not require employers to provide meal or breaks to employees. When employers choose to provide rest or meal breaks, it places restrictions on the employers. Thus, when employers provide employees rest breaks that last 20 minutes or less, federal law requires that those breaks be paid. Additionally, that time must be used in the sum to determine if overtime was worked. But, meal breaks that last 30 minutes or more are not required to be worked if the employee is relieved of all work duties. 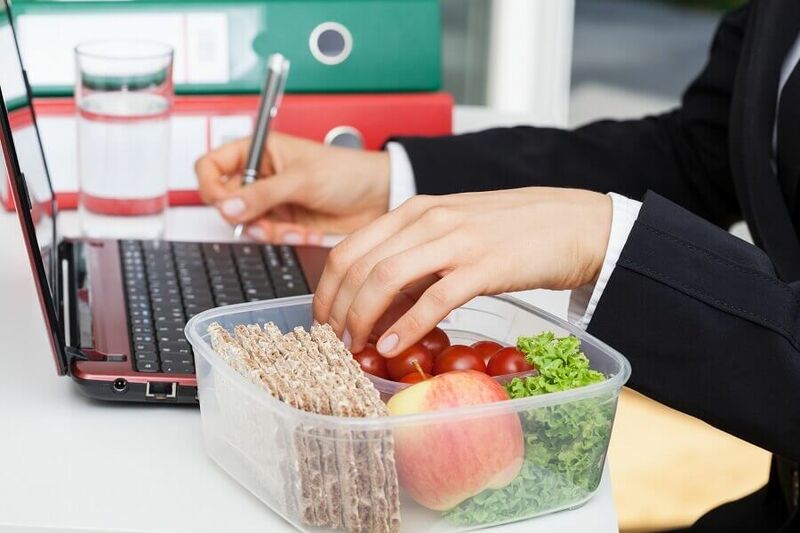 In a study by Right Management, 39% of employees admit to eating lunch at their desk more often than not, while 28% admit to rarely taking any breaks at all. This even happens in states that have mandatory break laws. Unfortunately, this can be problematic for employers. If your time and attendance automatically clocks employees out for lunch, even though a percentage of them are still working, and sets you up for FLSA violations. It is also a problem if your employee does take a lunch break, but continues to be responsible for work-related tasks. In these situations, employees must still be paid for their meal breaks. Not tracking breaks or lunch properly is a common off-the-clock work violation and can be very costly. It puts you at risk for a wage and hour lawsuit, DOL penalties, and squelches your employee’s creativity. All of these things affect your bottom line. In states like California, that require meal and rest breaks, it becomes extremely expensive for employers who do not follow break laws. As a result, it is very important to make sure that employees and managers understand the break expectations. But, because many employees will still feel the pressure to clock out and continue to work, it is just as important to make sure that employees and managers understand that properly tracking work time is just as important. Every state has varying employer requirements. Some states have expansive break requirements, while others are very minimal. Employers who use a time and attendance software can make sure that they track employees breaks as required by some state laws. These employers can also provide unpaid breaks when employees are clocked out for longer meal breaks. Alabama only has breaks requirements for minor employees. Minors who are the ages of 14 and 15 must be given a 30-minute rest during a shift of 5 hours or more. Any break that is less than 30 minutes long cannot be treated as an interruption from work. There are no break requirements for employees unless it is a minor employee. Any minor who works more than 6 hours in a shift must be given a 30-minute meal break. This is an unpaid break. The break should only be given after the minors first hour and a half of work and before the start of the minors last hour of work. In addition, minors who work a 5-hour continuous shift must also be given a 30-minute rest break before returning to work. Rest and meal breaks can be modified by the employer and the employee’s agreement. Arizona does not require private employers to provide meal or rest breaks to employees. Arkansas does not require either rest or meal breaks. If the employee is relieved of working, then the employer does not have to pay for the meal. The employee must be free to leave their workstation. Rest breaks of 20 minutes or less must be counted as time worked. Children under the age of 16 who work in the entertainment industry must be given rest breaks. California State law requires multiple breaks for employees. These breaks include meal breaks, rest and recovery breaks, breaks for employees paid on commission. State law also requires a day of rest break. Additionally, there are specific breaks required by individual California cities. In California, nonexempt employees who work at least 5 hours per day must be provided at least a 30-minute unpaid meal break. If the employee works for 6 or fewer hours, then the meal break can be waived through mutual written consent of both the employer and the employee. When an employee works 10 hours in a day, they must be provided with a second 30-minute unpaid meal break. If the total workday is less than 12 hours, then the second meal break can be waived. This requires the written and mutual consent of both the employer and the employee. If an employer fails to provide the required meal periods, then they must pay the employee an additional hour of pay at the employee’s regular rate of pay for each workday that the meal period was not provided. This means that if a $10 an hour employee works 7 hours and misses their meal break, they must be paid an extra $10 for the missed break. Employees who work in healthcare and work more than 8 hours can voluntarily waive one of their two meal breaks. The waiver must be a written document voluntarily signed by both the employee and the employer. The employee can revoke the waiver at any time with only a 1 day written notice. While the waiver is in effect the employee must be paid for all working time. The California Supreme Court has issued clarifications regarding California meal and break law. For example, although an employer is obligated to provide meal breaks and to relieve its employees of work duties, the employer is not obligated to ensure no work is done. Additionally, any work done by an employee during a meal break, who has been relieved of work, does not create a liability for premium pay. Remember that California requires a premium pay if meal breaks are not provided. Thus, if an employee is relieved of work duties for a meal break and the employee still does work, then the employer is not required to pay the premium. However, the employer could still be responsible for paying the employee at their regular rate of pay. The employer is only liable to pay when it knew or reasonably should have known the employee was still working during the meal break. Further, meal breaks should fall no later than 5 hours into a shift, but do not have to be scheduled in 5-hour increments. In California, nonexempt employees must be allowed to take a rest period. The rest must be in the middle of the shift, if possible. If the circumstances don’t allow the employee to take a break at the preferred time, then the employee must be able to take their shift at a different time. The amount of rest time that the employee receives is based on the length of their shift. Employees must get 10 consecutive minute break for every 4 hours. If the employee works a fraction of their work that is 2 hours or more, then they must receive a break. Any employee who works 3 ½ hours or more must receive a break. Rest breaks are counted as work and the employee must be paid for the rest time. Even though rest periods are paid time, employers cannot require the employee to stay on work premises during rest breaks. The employee must be relieved of all work related activities during the break. On-call rest periods are generally prohibited. It’s important to note that rest periods must be a new 10 minutes. This means that the rest period starts when the employee reaches the rest period. Employers must provide a break area that isn’t part of the restrooms. Commission employees must be provided with a separate pay schedule for rest periods. As part of an employees commission agreement, the commission-based compensation plans must include a separate pay for rest periods. Otherwise, the plan doesn’t comply with state law. If employers track hourly work by commission employees and pay an hourly wage that is an advance on the commission earned later, this is in violation of the law if rest periods are part of the “advance of wages.” paid. In California, employees are entitled to 1 day of rest every 7 days. The California Supreme Court has defined this as 1 day every work week. The exception to this rule is for employees who do not work more than 30 hours in the week and no more than 6 hours in a single day. The Day of Rest requirements allows employees to work longer than 6 consecutive days as long as the consecutive days roll over into another work week. If employees can be allowed to not take a day of rest, but must still be advised of their right to a day of rest. Furthermore, employees cannot cause an employee to go without a day of rest. A new nursing mothers break started on January 1, 2018, in San Francisco. Mothers must be allowed a “reasonable time” to express breast milk. The break time must run concurrently to any other rest breaks to which the employees are entitled. Any extra time that the employee needs does not have to be paid time. Employers must provide a lactation location close to the employee’s work area. That area must be separate from the restrooms. The area must include a refrigerator and a sink with running water. It can be in the same location as the employees work area and must be free from intrusion from coworkers and the public. Colorado requires that employees who work 5 hours or more be allowed at least a 30-minute meal break. The meal break can be unpaid if the employee is relieved of all work-related activities. Employees must be allowed to pursue personal activities during this time. If the employee eats their meal while being responsible for any work activities, then the break must be paid. Employees in certain industries must be allowed a 10-minute break for every 4 hours worked. If possible, the rest breaks should be during the middle of the employee’s shift. The industries that require rest breaks are retained and service occupations, occupations dealing with food and beverage, health and medical occupations, and commercial support services. In Colorado, certain employees are exempt from the requirements for rest breaks. Administrative, executive, supervisory, professional and outside sales employees are exempt from rest break requirements. In addition, property managers, interstate drivers, driver helpers are exempt. Other employees such as loaders or mechanics of motor carriers and taxi cab drivers are exempt. Finally, bona fide volunteers and students employed in a work experience study program are exempt. Delaware requires at least 30 minutes for a meal break anytime an employee works at least 7.5 hours in a day. The meal break must happen after at least the first 2 hours of the shift and before the final 2 hours of the shift. Meal breaks can be unpaid time, but the employee must be relieved of all work activities and the time must be uninterrupted time. There are several exceptions to Delaware law. Under these exceptions, employees must be allowed to eat at their workstations and to use the restrooms as needed. If compliance with the meal break requirement would adversely affect public safety. This includes the possibility of harm or damage to any person or property if the employee were given their 30-minute meal break. Another exception is if only the employee can perform the duties of the position. A third exception is if an employer has 5 or fewer employees on one location during that shift. This exception only applies during the shifts that have 5 or fewer employees on location. The last exception is if the employer’s conditions require employees to be able to respond to conditions at all times. An example of this is chemical production or research experiments. If any of these exceptions apply, then the employee must be paid for the time spent eating at their workstations and using the restrooms. Any employee under the age of 18 cannot be allowed to work for more than 5 hours continually without at least a 30-minute break. D.C. does not require specific meal or break periods but does have a break required for nursing mothers. Employers are required to provide a reasonable break time to mothers to express breast milk. This break time can coincide with other breaks provided and can be paid or unpaid. Employers must make efforts to provide a sanitary room in close proximity for the employee to express milk. This room cannot be the toilet or restroom. Employers can be excused from this requirement if doing so would cause an undue hardship on the employer’s operations. Florida has meal and rest break requirements for minor employees. Minor employees cannot work more than 4 consecutive hours without at least a 30-minute break. There are 4 exceptions to this law. First, minors who are 16 and 17 years old and have graduated from high school are exempt. Second, minors who are within the required school attendance age limit who hold a valid certificate of exemption issued by the school superintendent are exempt. A third exemption is for minors enrolled in a public education institution who qualify for a hardship exception such as an economic necessity or a family emergency. The final exemption is for children in domestic service in private homes, children employed by their parents, and pages employed in the Florida legislature. Minors in Florida is any person who is under the age of 18. However, under certain exceptions, individuals aren’t considered minors. This includes if the person is or has been married. It also includes if the person’s disability of nonage has been removed by the court. Another exception is if the person has served or is serving in the U.S. Armed Forces. The court can find it in the best interest of the person to work and can specifically approve the terms and conditions of employment. Finally, if a person has graduated from high school or an equivalent, they are exempt from the minor break law provisions. Georgia law doesn’t require specific meal or rest breaks. However, the state’s law does require a break for nursing mothers and an accommodation of religious beliefs. Nursing mothers must be provided with unpaid breaks to express breast milk. The employer must make reasonable accommodations to provide her with a room, which is not toilet stall, to express her milk in privacy. The break time can run concurrently with other breaks provided by the employer. If providing a nursing mother breaks would unduly disrupt the operations of the employer, then the employer is not required to provide the break. Georgia requires that employers who work on Saturday or Sunday to make reasonable accommodations to the needs of their employees. This includes the employees’ religious, social, and physical needs of the employees who worship. Hawaii’s only break laws pertain to nursing mothers and minors. Employers in Hawaii must provide reasonable break time for nursing mothers to express milk for the first 1 year after the child is born. The breaks must be provided each time the employee has a need to express milk. Employers must also provide a private location that is not the restroom for the employee to express milk. Employers must post notice of this law in a conspicuous place and use other means to inform employees of this right. Small employers, those with 20 or fewer employees, who can show an undue hardship and be exempt from the requirements of the law. Idaho does not have any meal or break requirements. Illinois has a meal break requirement and a day of rest requirement. Employees who work 7.5 hours or more during a shift must be provided with at least 20 minutes of an unpaid meal break. The break cannot be given more than 5 hours after the start of the shift. Employers must provide employees a day of rest each week. This is defined as 24 consecutive hours of rest in every calendar week. There are 5 exceptions to this requirement. These include part-time employees who work 20 hours or less a week. It also includes employees who are vitally needed. Employees in agriculture, mining, or security are exceptions. Professional, Admin, and Executive employees are also excluded. Employees needed for an emergency requiring the immediate service of experienced or competent labor to prevent injury to person, damage to property, or suspension of necessary operations. Administrators, executive, and professional workers. Employers can also get permits from the Illinois Department of Labor allowing employees to voluntarily work 7 consecutive days. Before employers can operate on Sunday, they must post, in a conspicuous place, a schedule listing the employees that are working on Sunday. This list must also designate the day of rest for each employee. Indiana does not require meal or rest breaks unless the employee is a minor. Employers must provide minors one or two rest periods that total 30 minutes.This is applicable when the minor works at least 6 consecutive hours. The required breaks can be taken any point during the shift. Employers must also maintain a record of all paid and unpaid breaks to minor employees. Iowa does not require meal breaks or rest breaks. The only exception is for minor employees. Employees who are under 16 years of age must be given a 30-minute break if they work 5 hours or more. Kansas does not have any meal or rest break laws. Kentucky has a meal break, rest break, and day of rest break requirement. Employers must provide a reasonable lunch period close to the middle of the employee’s shift. This break can be no earlier than 3 hours from the beginning of the shift. It can also be no later than 5 hours after the beginning of the employee’s shift. In addition, employees must be provided with a 10-minute rest break during every 4 hours of work. Lastly, employees must receive at least 1 day of rest during every calendar week. Employees in Louisiana who are under the age of 18 must be given a 30-minute meal break. This is applicable anytime the employee works 5 or more consecutive hours. The meal break can be unpaid. Maine required both meal and rest breaks. Employees who work 6 or more consecutive hours must be allowed to take a 30-minute consecutive break. If the employee is completely relieved of duties, then the rest time can be taken as unpaid time. Employers who have 3 or fewer employees on duty at a time are not required to provide this rest period. However, they must allow more frequent shorter breaks for these employees. Additionally, in any case, that the employee’s break would be a danger to property, life, public safety, or public health, the break is not required. Another exception is when the employee fits into certain categories. This includes executive, administrative, and professional employees who have an annual salary 3,000 times the state’s hourly minimum wage. It also includes certain agricultural employees and taxi cab drivers. Lastly, it includes commission employees whose hours and places of employment are not substantially controlled by the employer. Maryland has two main break requirements. First, minors must receive a 30-minute break for every 5 hours worked. Second, the Healthy Retail Employee Act requires that retain employees be given a non-working shift break. This includes a 15-minute non-working break when the employee works 4-6 consecutive hours. If the employee works more than 6 consecutive hours, then they are entitled to a 30-minute break. In Massachusetts, most employees must be given a 30-minute break after 6 hours of work. In addition, most employees must be given a day of rest after working 6 consecutive days. The day of rest is defined as 24 hours of rest and must include the interval from 8:00 am to 5:00 pm. Domestic workers have separate break entitlements. These are provided for by the Domestic Worker Bill of Rights. Employers who employ a domestic worker for 40 or more hours a week must provide a rest period of at least 24 consecutive hours each calendar week. They must also provide at least 48 consecutive hours during each calendar month. If possible, that time must allow for religious worship. The domestic worker can voluntarily agree to work on a day of rest. However, this agreement must be in writing. The domestic worker must also be paid an overtime rate for all hours worked on that day. It’s important to note that the day of rest counts as job-protected leave from employment. When a domestic worker does not live on premises and works for less than 24 consecutive hours, then the employer must pay the domestic worker for all hours on the premises. This means that working time includes all the time the worker is required to be on the employer’s premises. It also includes any time before or after the normal shift needed to complete work. In addition, that time must include meals, breaks, and sleeping periods unless the worker is free to leave the employers premises. If the domestic worker is free to leave and to pursue personal activities and is relieved of all work activities, then that time does not have to be paid. When domestic workers are required to be on duty for 24 consecutive hours or more, then the employer and worker must agree to exclude a regularly scheduled sleeping schedule of no more than 8 hours from every 24 hours period. In addition, all breaks, rests, meal periods, and sleeping periods constitute working periods. Employers who employ a domestic worker for at least 16 hours or more a week must provide employees with information regarding meal and rest breaks. This includes information about working hours, meal breaks, and time off. It also includes the provisions for the days of rest, sick days, vacation days, personal days, and holidays. It must include information about transportation, health insurance, severance, and yearly raises. It must also include information about whether or not these benefits are paid or reimbursed. Michigan requires that minor employees be given at least 30 consecutive minutes or more for every 5 hours worked. There are no other meal or rest break requirements in Michigan. Employees in Minnesota must be given a sufficient break to eat a meal. The break may be unpaid if its at least 20 minutes long. If the break is less than 20 minutes, then the break must be paid. Nursing mothers must be provided with an unpaid break each day to express milk for her infant child. The break can run concurrently with any other breaks provided by the employer. Employers must also make reasonable efforts to provide a room or location that is free of a toilet for the employee to express milk. The location should be in close proximity to work and be in private. It must also include access to an outlet. If the employer makes a reasonable effort, then the employer is held harmless. Employees must be given access to a restroom break every 4 hours worked. Mississippi has no meal or rest break laws. Missouri does not require meal or breaks to employees. Montana has few requirements around meal or break laws. Rest breaks are not required in Montana. However, if the employer provides rest breaks, then that time must be counted as time worked. Meal breaks must also be counted as time worked. The only exception to this is if the meal break is at least 30 minutes long and if the employee is relieved of all work duties. The State of Nebraska does not require any specific meal or rest breaks. New Mexico does not require any specific breaks, but does requires that any breaks that are less than 30 minutes be paid work time. New Jersey employment law requires that minors must be given at least 30 minutes of break time if they work more than 5 continuous hours. In addition, the state also requires reasonable accommodations to be made for an employees pregnancy and for nursing mother employees. Nursing mothers must be provided with reasonable breaks and a room to express breast milk. The location accommodations cannot include a toilet stall. In New Hampshire, employers must provide a 30-minute meal break to all employees who work 5 hours or more. If it’s feasible for employees to eat during working hours, and the employer allows them to, then a meal break is not required. If a New Hampshire employee works on Sunday, then that employee must be given a 24-hour rest during the following 6 days. In addition, employers who operate on Sundays must post a list of the employees required to work on Sundays and when their alternative day of rest break is during the week. This list must be posted in the workplace and must be filed with the New Hampshire Labor Commissioner. Employees in retail stores resort areas, inns, theatres, motion picture houses, hotels, and restaurants. Nevada requires breaks for meals, rest, nursing mothers, and domestic workers. Employers must provide employees with at least a 30-minute meal break for every 8 hours of continuous work. In addition, employees must be provided with at least a 10-minute rest break for every 4 hours worked in a day. If the employee’s total work time is 3 ½ hours or less, then a break is not required. However, there are a few exceptions to meal and rest breaks. For example, if only one employee is at a specific place of employment, then the breaks are not required. In addition, any employees covered by a collective bargaining agreement fall outside these requirements. Lastly, if the employee has applied and received an exemption from the Nevada Labor Commissioner based on necessity, then breaks are not required to be provided by that employer. Nursing mother break laws apply to mothers who have a child under the age of 1 year at home. These employees must have a reasonable break time to express milk. This break can be paid or unpaid. Nursing mothers must also be provided with a place that is not a bathroom. The location must be free from dirt and pollution, protected from the view of others, and free from intrusion. However, if an employer determines that these provisions would cause an undue hardship, then the employer and employee can meet and agree upon a reasonable alternative. If both parties can’t agree, then the employer can require an employee to accept a reasonable alternative provided by the employer. Further, retaliation to employees who exert their right to a nursing mother break is prohibited. Employers who have less than 50 employees are not subject to the requirements of the law if the requirements would impose a hardship on the employer. All periods of complete freedom. These periods must be long enough for the domestic worker to make use of it and the worker must be allowed to leave the premises. If an unpaid break is interrupted by the employer, then the interruptions must be counted as hours worked. Employees who are required to work or be at a residential facility for 24 hours or more may have a sleep period of up to 8 hours excluded from the worker’s wages. The employer and employee may agree in writing to have the sleep period excluded. Plus, adequate sleeping facilities must be provided by the employer. In addition, any interruptions of the sleep period must count as working hours and be paid. If the interruption causes the sleep break to be less than 5 hours, then the entire sleep period must be paid by the employer as wages. Domestic workers who work 40 or more hours a week must be provided for at least a break of 24 consecutive hours per calendar week. Additionally, they must be provided with a 48 consecutive hour rest every calendar month. New York has several break laws including meal break laws, breaks for home health attendants, breastfeeding breaks and day of rest breaks. Employees who work during the lunch period must be allowed at least 30 minutes off for a meal break. Employees who start work before 11:00 am and work until after 7:00 pm must be allowed a second meal break of at least 20 minutes. In addition, employees who work at least 6 hours between the hours of 1:00 pm and 6:00 pm must be allowed a meal break of at least 45 minutes. This break should be between the beginning and the end of the shift. However, in a situation where only one employee is on the job or in a specific occupation, the employee may volunteer to work without a break. The employee must be allowed to eat on the job. If the employee requests a meal break, then it must be granted. Plus, in certain situations, the New York Department of Labor may permit shorter breaks. This will be in writing and must be posted at the main entrance of the workplace. The rules for New York home health care attendants is not a law, but an opinion has been issued by the New York State appeals court. In NY, home health care attendants who work at a residence in a 24-hour shift, but does not reside there must be paid for all 24 hours. This includes any time awarded to the attendant for rest, meal or sleep breaks. In contrast, state minimum wage law does not require home health care workers, who are working 24-hour shifts, to be paid minimum wage for rest and meal breaks. Rest breaks in New York State are not required. However, if the break is shorter than 20 minutes, then it must be a paid break and counted as work time. Employers must allow employees reasonable break time to express breast milk. This break applies for the first 3 years after a child is born. Breaks can be rest or meal breaks and can be paid or unpaid breaks. Further, employees must be provided with a separate private room to express milk. The room must be in close proximity to the work area. Employees who use the nursing mother’s break cannot be discriminated against for the use of this break. New York requires a day of rest each calendar week for employees working in certain industries. The day of rest must be at least 24 hours. This applies to employees that work in factories, mercantile establishments, hotels, restaurants, and office and apartment buildings. North Carolina requires that employees under the age of 16 be given at least a 30-minute rest break after 5 hours of work. There are no other required rest or meal breaks in North Carolina. North Dakota requires all employees who work 5 hours to be provided with a 30-minute meal break. This applies anytime there are 2 or more employees on duty. If the employee is completely relieved of work duties, then the break can be unpaid. The employment law that requires a day of rest applies to businesses that sell merchandise at retail locations. The employer cannot require an employee to work 7 consecutive days. In each, 7 consecutive days, the employer must provide employees with at least a 24 hours day of rest break. The time off is in addition to other regular periods of rest allowed during each day worked. Unless it would cause a hardship for the employer, the employer must accommodate the religious beliefs and practices of the employees. Employees in Ohio who are minors must be given a 30-minute break for every 5 consecutive hours worked. This break is unpaid. Ohio does not have any additionally required rest or meal breaks. Oklahoma employees who are under the age of 16 yrs of age must be given a 30-minute break for every 5 consecutive hours of work. In addition, these employees must be given 1 full hour of rest for every 8 consecutive hours of work. However, there are no other rest or meal break requirements in Oklahoma. Employers in Oregon must offer several types of breaks. Oregon employers must provide breaks to non-exempt employees and to minors. Non-exempt employees must be given a meal break of at least 30 minutes for every shift that is 6 hours or longer. If a shift is 6-7 hours long, then the employee must be given the break between the second and fifth hours of the shift. If the shift is longer than 7 hours, then the break must be given between the third and sixth hours. In addition, minors must be given a meal break of at least 30 minutes. This break must be given no later than 5 hours and one minute after the minor starts their work shift. Furthermore, non-exempt employees must be given a second meal break if their shift is 14 hours or longer. The meal breaks can be unpaid, but the employee has to be relieved of all work duties. If the employee is not relieved of all work duties, then the meal break must be paid. However, it is important to note, that all employees who are 14 or 15 years of age must be relieved of all work duties during the work break. There is no exception to this requirement. Employees (non-minor) can be excused from the 30-minute meal break if their break would cause undue hardship to the employer’s operation or in other limited circumstances. All employees must receive a rest break of at least 10 minutes for every 4 hours that are worked. Minor employees must be given 15 minutes for every 4 hours worked. Nevertheless, it is important to note that, in Oregon, breaks are not optional. Employees may not waive their right to a break. Employers can require non-exempt employees to take all their required breaks. Employers can also discipline employees for not taking breaks. Oregon passed a law regarding domestic workers’ rights that went into effect on January 1, 2016. As a result, domestic workers in Oregon are required to be given 24 hours of rest every workweek. If the worker agrees to work on the designated day of rest, then they must be paid overtime for those hours. Plus, any domestic worker who worked an average of 30 hours a week or more the previous week, then the employer must provide the worker with at least 3 paid personal days off. Domestic workers who live in their employer’s homes must be given several break periods. First, every 24 hours, workers must be given at least 8 consecutive hours of rest and must be provided with an adequate place and conditions for uninterrupted sleep. Second, the domestic worker must be allowed to cook their own food. Employers can place reasonable restrictions based on the religious or health needs of the home’s residents. Employers in the Oil State must provide minor employees a meal break of at least 30 minutes when the employee works 5 hours or more in a shift. There are no other break requirements in Pennsylvania. Rhode Island requires most employees to be given at least a 20-minute meal break during a 6-hour shift. Employees who work 8 hours or more must be given at least a 30-minute meal break. The meal breaks may be unpaid. In addition, Rhode Island protects employees who refuse to work on a Sunday or a holiday. Employers are prohibited from retaliating or discriminating against these employees. There are no required meal or rest breaks in South Carolina above what Federal Law requires. South Dakota does not require any specific meal or rest breaks to be given to employees. Employers in Tennessee must provide employees with at least a 30-minute meal break when the employee works 6 consecutive hours or more. The only exception to this is when the workplace environment or the nature of the business provides ample opportunities to rest or take a break. The restriction on this rest break is that it may not be scheduled before the shift starts or during the first hour of the shift. However, if a tipped employee and the employer agree, the rest period may be waived by mutual consent. Employees who need to express breastmilk must be provided reasonable breaks to express milk. These breaks can be unpaid. Employers must provide the breaks unless it would unduly disrupt the operations of the employer. The break time must run concurrently with any other breaks provided by the employer. In addition, employers must make a reasonable effort to provide a room, or other location, in close proximity to the work area where an employee can express milk in private. This location cannot be a toilet stall. Texas does not require any meal or rest breaks. However, employers must provide employees with at least a 24 hour rest period to rest or worship every 7 days. Utah requires meal and rest breaks for minor employees. Minor employee must be given a meal break of at least 30 minutes. This meal break must be no later than 5 hours after the employee starts working. Plus, employers must pay for the meal break if the employee is not relieved of all work duties during the meal break. In addition, minors must receive a 10-minute break for every 4 hours worked. Minor employees may not work more than 3 consecutive hours without a break. Vermont state law doesn’t require specific meal or rest breaks, but it does require that employers provide employees with reasonable opportunities through the shift to use the restrooms and to eat. Virginia law doesn’t require any designated rest or meal breaks except for minor employees. Employees who are under the age of 16 and who work 5 or more consecutive hours must be provided with a meal break. This break should be at least 30 minutes long. Washington requires employees who work 5 hours to get at least a 30-minute break. This break must be given no earlier than 2 hours and no later than 5 hours after the start of a shift. And, special rules for minors apply. Employees who are 14 and 15 years old can go no longer than 4 hours without being given a meal period of at least 30 minutes. Employees who are 16 and 17 years old cannot be required to work more than 5 hours without a meal break of at least 30 minutes. This break must also start between the 2nd and the 5th hours of the shift. Another 30-minute meal break must be provided before an overtime shift that is 3 hours longer than the normal workday. In Washington, meal breaks can be unpaid as long as the employee is completely relieved of all work duties. If the employee is required to remain on the work premises or at a prescribed place, then the meal break must be paid. But, what happens if an employee misses a meal break? The Washington Supreme Court has ruled that an employer is not automatically liable if an employee misses a meal break because an employee can waive the break. Employers can rebut any allegations of break-law violations by showing that no violation occurred or showing a valid waiver. Washington employers must provide employees with a rest break that is 10 minutes long for every 4 hours worked. As must as is possible, the break must be scheduled in the middle of the shift. Plus, an employee cannot be required to work more than 3 consecutive hours without a rest break. When the nature of the work allows employees to get a 10-minute break for every 4 hours of work, then the employer is not required to schedule rest breaks. Additionally, minors must be provided with additional hours. Employees who are 14 or 15 years old must be given a 10-minute rest break for every 2 hours of work. Employees who are 16 or 17 years old must be given a 10-minute break for every 3 hours of work. Washington courts have held that when workers work through their rest breaks, then the missed, entitled breaks time can push workers hours into overtime pay. Employees who are not permitted to eat while working and are not allowed the necessary breaks must be given at least a 20 minute meal period when they work 6 hours or more. Employees under the age of 16 must receive a 30-minute meal break if they work a shift of 5 hours or longer. Wisconsin recommends breaks to adult employees and required breaks for minor employees. Adult employees should be given a break of at least 30 minutes for any shift that is longer than 6 hours long. Additionally, employers in the state should give a meal break for each meal period the employee works through. Those meal periods are the times of 6:00 am, 12:00 pm, 6:00 pm, and 12:00 am. Yet, minor employees must be given the above meal break requirements. Any meal break that is less than 30 consecutive minutes must be counted as time worked and be paid to the employee. Wisconsin requires that employees be paid for all “on duty” meal breaks. These are the breaks where the employee is not completely free of all work duties. Any businesses that are operating factories or mercantile establishments must provide a day of rest to its employees. Mercantile establishments include any business that is involved in retail trade. Employees must be provided with a day of rest break, that is 24 hours long, every calendar week. Paper and pulp mills day of rest rule does not apply to superintendents or department heads whose work is not manual. But it does apply to machine operators. Employees can voluntarily waive the one day in seven rest period in writing. Wyoming does not require any specific meal or rest breaks. Employers across the USA have to comply with break laws. Additionally, many businesses have to comply with multiple conflicting City ordinances defining Sick leave accrual and usage laws.